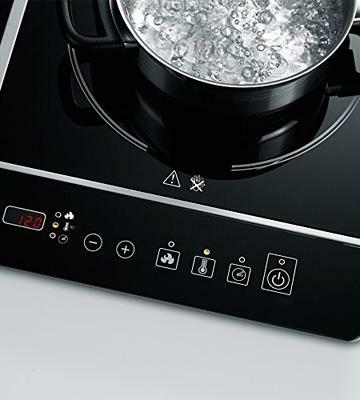 With its durable glass surface and high power level, this induction cooktop will perfectly handle boiling water, heating foodstuff, and other cooking operations. 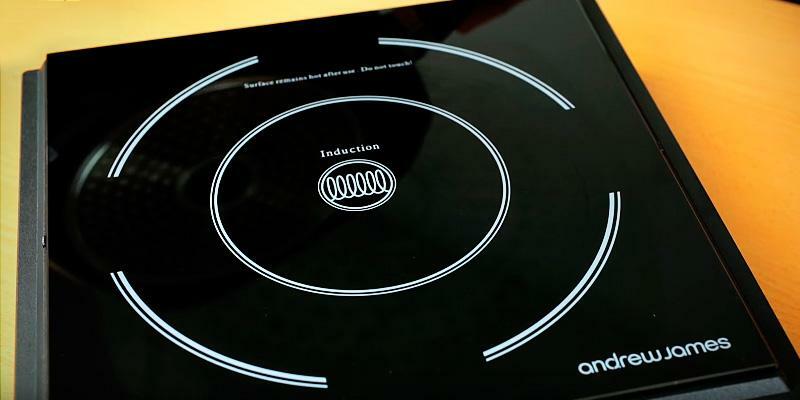 If you're looking for an effective, economical, and stylish induction hob to substitute a gas stove, Andrew James AJ000127 is just what you need. 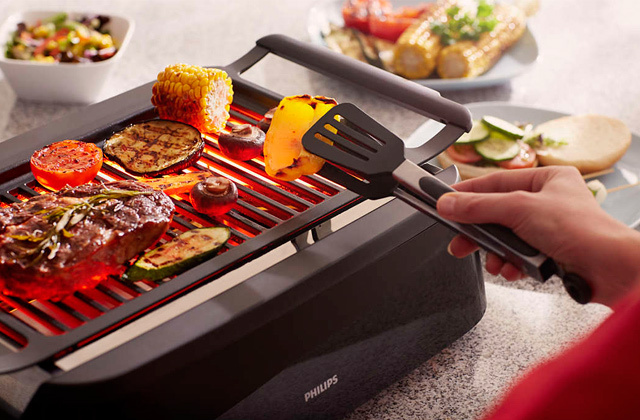 Automatic cooking modes save you a trouble of choosing right temperature and power for this or that dish on your own. The minimal power of 450 W might be too high for some dishes. Smart and compact, Tefal IH201840 will become a perfect solution for a small kitchen. 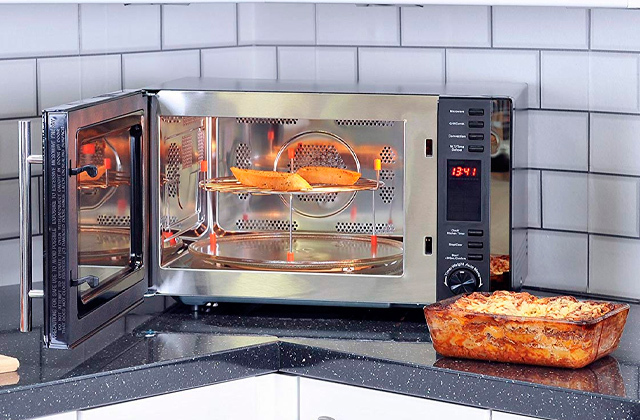 Cooking your favourite meals and saving space at the same time is possible with this model. Light weight of this induction cooktop makes it easily transportable, and small size guarantees a convenience of storage. It's inconvenient to read information on a display at an angle. 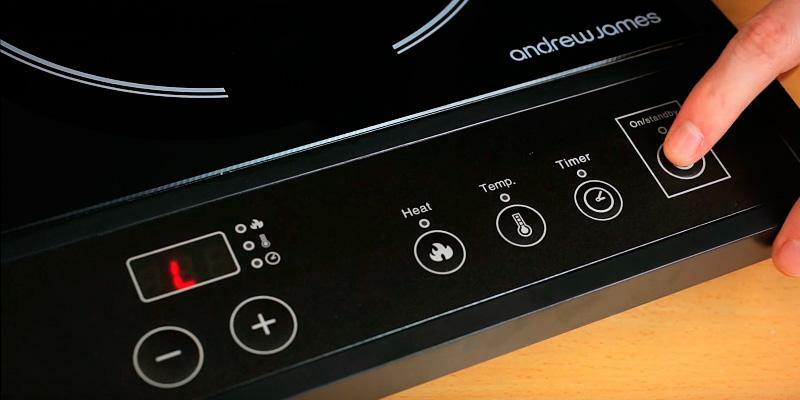 If you've never used an induction cooktop before, Andrew James AJ000058 is deserving to become your first hob. 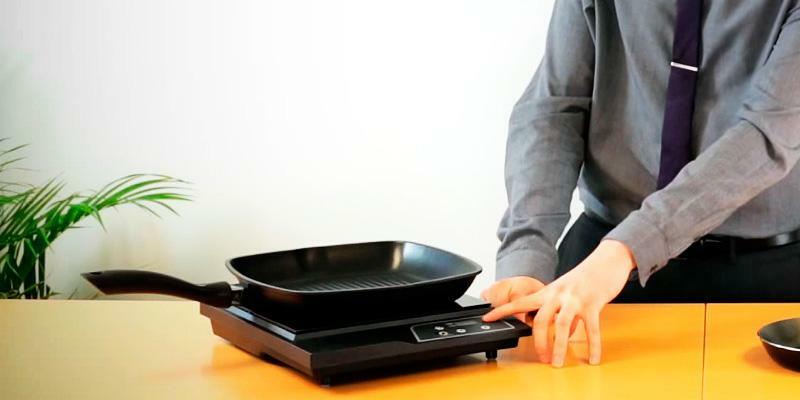 With its simple controls, cooking the most complicated dishes will become a piece of cake. Slim design of the hob provides convenient usage and storage. 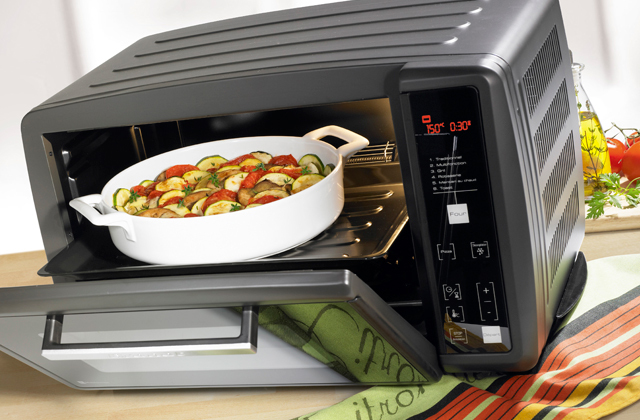 High power levels speed up the cooking process, so you don't need to spend hours in the kitchen. The maximum power consumes a lot of energy. 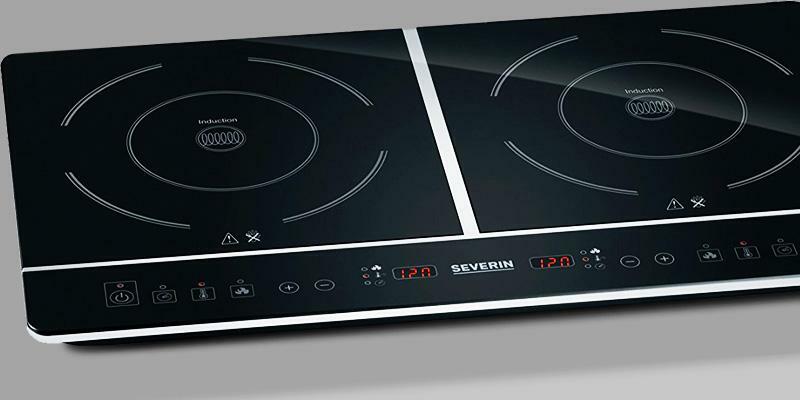 Severin DK 1031 induction hob will come to your liking if you not only need to cook fast and tasty but also want to adorn your kitchen with a stylish appliance. The hob is equipped with the Keep Warm function. A signal notifies you that the chosen option is applied successfully. Fans work a bit loudly. Need an additional hob in your kitchen? Or your kitchen is too small for a full-size stove? Then, ElectrIQ is the best choice. 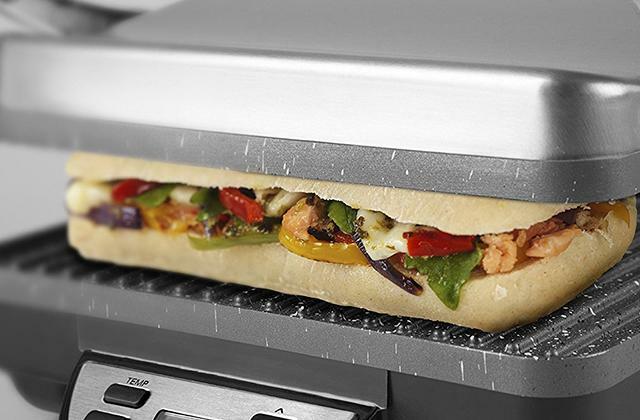 Take it out of the box, plug it in, and cook your meals effortlessly. 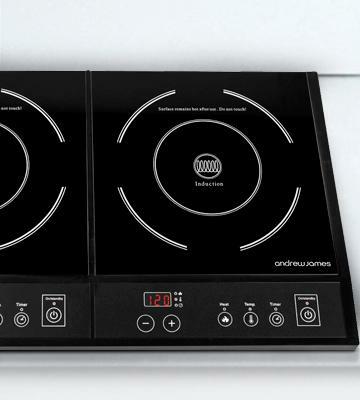 If you’re looking for an appliance to substitute your gas stove or electric cooker, Andrew JamesAJ000127 Double Induction Hob will definitely come to your liking. As its name implies, this cooktop boasts two independent burners that feature their own maximum power (1000 W for left hob and 1800 W for the right one) and separate on/off buttons. Don’t overlook 60°С to 240°С temperature range with a 20°С increment that makes it easy for you to choose the most suitable option for any foodstuff you process, even if you cook several meals at the same time. One more advantage is the heating speed that is twice as high as its gas or electric rivals possess. 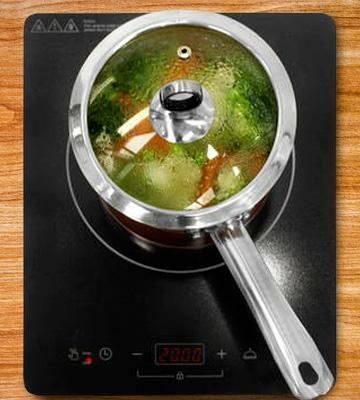 Not only this feature makes cooking fast and more convenient but also cuts your electricity bills. Don’t hesitate to choose Andrew James AJ000127 Double Induction Hob, and you’ll get economical and effective cooktop that will definitely find its place in your kitchen owing to its simple yet stylish design. 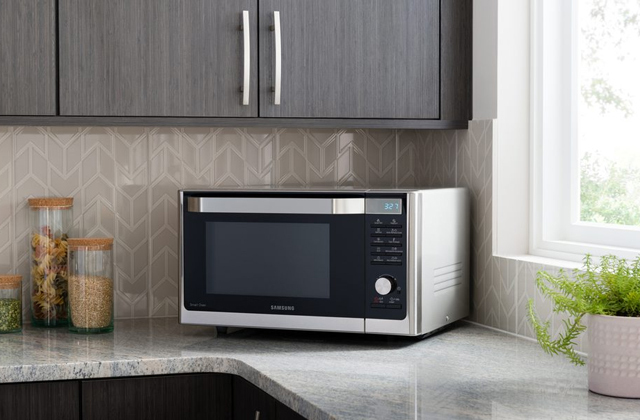 If you cook a lot and often need to heat food up, you might need to have a microwave oven in your kitchen. It goes without saying that cooking is a part of our everyday routine that can be quite tiring and time-consuming. Understanding this fact, the manufacturer has equipped Andrew James AJ000127 with a 3-hour timer. 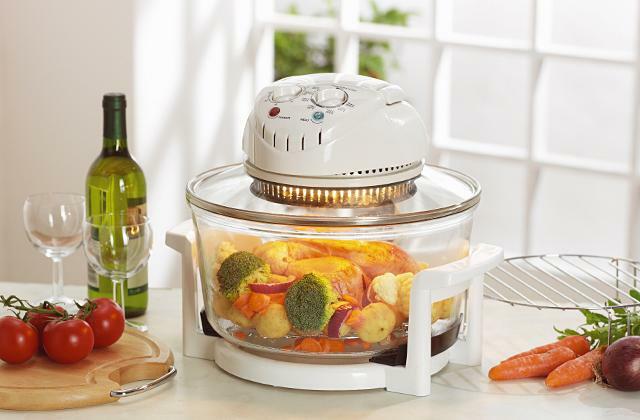 This function offers you an opportunity to cook meals while doing other household chores. Moreover, you can check the time left or current temperature and power level by pushing Temp./Heat button correspondingly on an LCD display. By the way, the model has two displays to give you information about each hob. The last but not the least thing to consider is safety features. The beauty of induction cooktops is that they don’t start to heat up until you put suitable cookware on their surface, so there is no chance of burns. To ensure hassle-free cleaning of the given model, the manufacturer has equipped it with black glossy glass surface, so wet cloth is the only thing you need to remove stains from the cooktop. What is more, the smooth design prevents food debris from accumulating during the cooking process, thus, it greatly reduces bacterial growth. 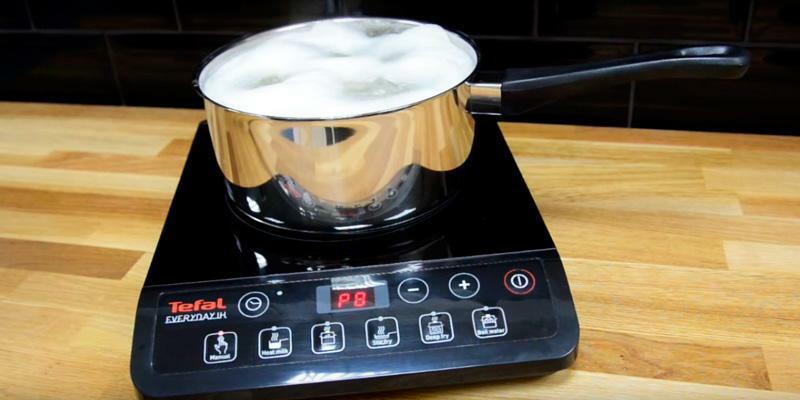 The first thing that catches an eye when considering Tefal IH201840 Induction Hob is 6 preset cooking functions. The first one won’t surprise you as it’s manual mode commonly found in most induction cooktops. But let’s take a look at other functions to find out what differs this model from its rivals. Heat milk mode is 85°С – a perfect temperature to heat milk without it boiling over. Stew function operates within 80°С - 100°С temperature range and will come of great use if you prefer stewed meals. If you’re a junk food lover and don’t mind having crisps or fried chicken for dinner, a cooktop in a deep fry mode will cook these dishes for you. If you want your fried meals to have an even crispy crust, stir fry mode is just what you need. There is no need to explain what boil water function is. We would only like to mention that producing the heat of 220°С, this appliance helps you boil large amounts of liquid in mere seconds. If you like fried meals but want them to be as healthy as possible, choose one of the best-selling air fryers represented on the market. 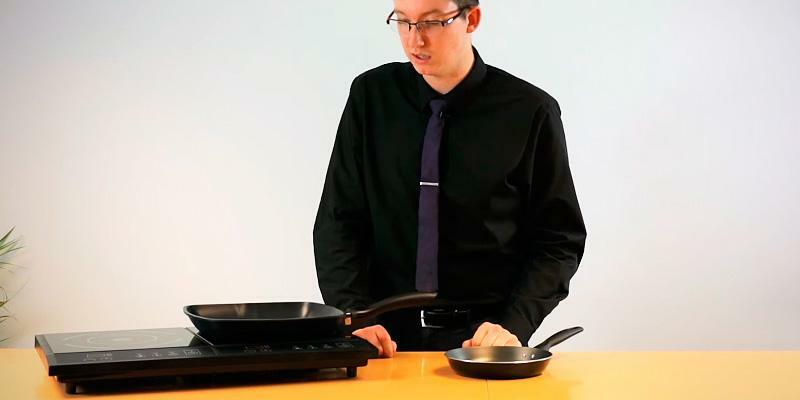 As a rule, buyers want their every purchase to serve them a lifetime, and Tefal company has done its best to meet this requirement. It becomes possible thanks to a ceramic plate that boasts scratch- and heat-proof qualities. By this, we mean that you can put cookware of various weights on the cooktop without the risk of damaging it. Additionally, ceramics is quite easy to maintain, cleaning it with a soft damp cloth is enough to keep its smart look for a long time. However, keep in mind that the best way to provide longevity of the device is to use it properly. 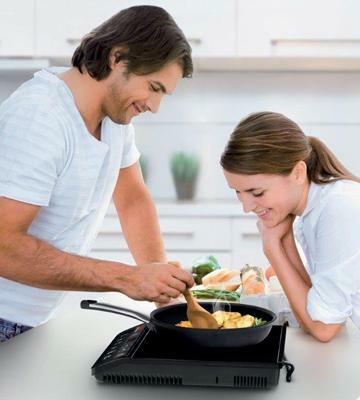 That’s why it’s recommended to avoid using cookware with a rugged base even on the cooktops of the most decent quality. What makes people choose induction cookers over gas and electric stoves? Well, there are some reasons. 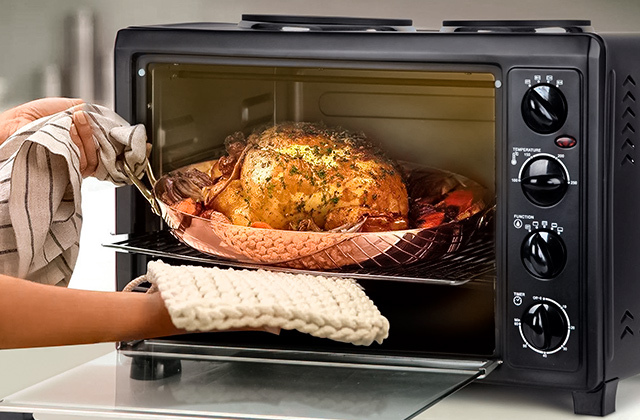 First of all, cooking with an induction appliance takes less time due to higher heating speed. Secondly, manufacturers pay close attention to safety issues. Actually, the idea of induction cookers is safe itself. The thing is that cooker’s surface doesn’t heat up until you put cookware on it. Furthermore, induction elements don’t heat the space outside the cooker, so you can leave stuff nearby and be sure it won’t burn. Power surge protection is worth mentioning too since it prevents the appliance from accidental breakage, thus, prolongs its service life. Finally, the majority of induction appliances feature child lock function to prevent your curious kids from accidents. If you’ve never used an induction countertop before but would like to try all advantages of such appliance for yourself, we recommend you to consider Andrew James AJ000058 Induction Hob. Possessing maximum power of 2000 Watt, the cooktop is able to process your food quickly without high electricity consumption. What is more, power and temperature are adjustable, and each function has 10 options to choose from. This very feature gives you a chance to combine the most suitable settings for your meal, no matter what you cook, be it vegetables or beef. It’s easy to find out that the meal is ready if you’re a professional chef. However, novice cooks might need a cooking thermometer for this purpose. 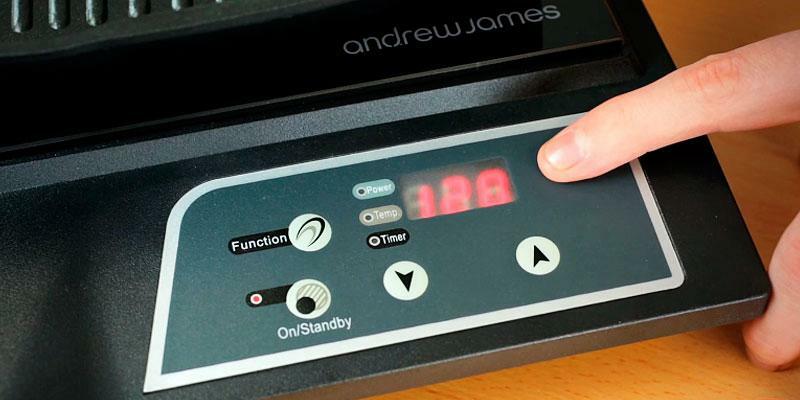 Cooking with Andrew James AJ000058 Induction Hob is a piece of cake thanks to intuitively understandable control panel consisting of four soft touch buttons and a small LCD display. No need to mention the purpose of on/standby button – upon pushing it once, you’ll always know whether the cooktop is ready to work. Function button allows you to choose among power, temperature, and time and change them to get necessary cooking conditions. Plus, each of three functions has a light indicator nearby that shows which one is chosen at the moment. Two other buttons are arrow keys aimed at helping you increase or decrease power, temperature, and time settings displayed on the LCD screen. In addition to all the features described above, we would also like to draw your attention to compact size and light weight of this induction cooktop. So, if you need an additional burner at your friend’s or during a hiking trip, you’ll hardly find a better model than Andrew James AJ000058 Induction Hob. If stylish look of a new appliance is as important to you as its performance, it’s time to pay attention to Severin DK 1031 Table Top Double Induction Hob. Thanks to its black colour, ceramic surface, and digital controls, this cooktop will definitely find its place in any modern kitchen. However, hi-tech design isn’t the only advantage of the device, its main features are worth mentioning too. Two burners (one of 2000 W and the other of 1400 W) have individual controls and displays, so it is possible to use them both to make dishes requiring different cooking conditions. Power level and temperature adjustment is one more thing that allows you to follow recipes precisely. And timer function rids you of the necessity to check on the foodstuff’s readiness every 10 minutes. If you prefer cooking in precise accordance with recipes, measuring cups will be of great use. 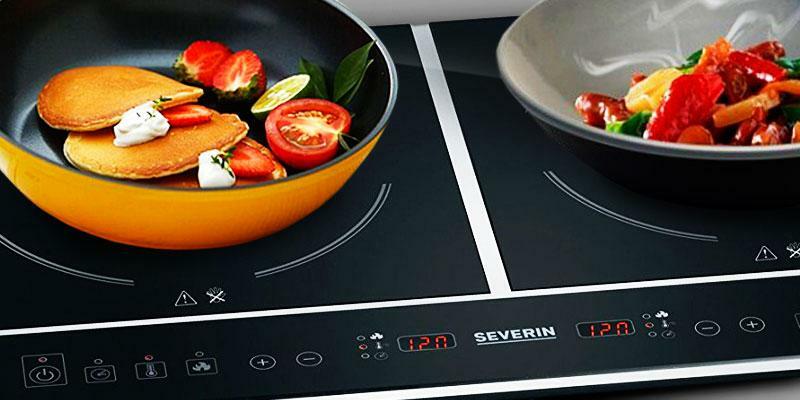 One of the most outstanding advantages of induction cooktops is their high heating speed, and Severin DK 1031 isn’t an exception. Thanks to a fairly high power of each hob, this appliance speeds up the cooking process quite a bit. Additionally, if a recipe requires you to use specific power level, you can pick one of 10 preset options for every burner. By the way, choosing necessary cooking conditions is as easy as anything with handy touch controls. Every selected function is accompanied with a sound signal, so you know for sure the cooktop has carried your order out successfully. On top of that, it’s comfy to check set conditions on one of LCD displays. 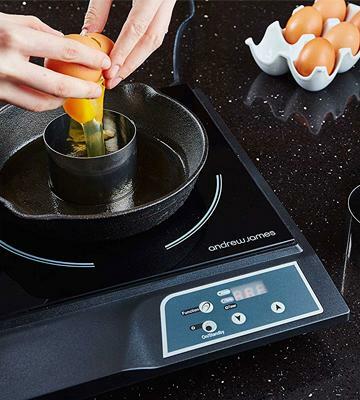 Just as many other induction cooktops, this one also features a ceramic surface, and it comes as no surprise since ceramics boasts many advantages. First of all, the material looks classy and adds an elegant touch to any kitchen interior. Secondly, it is cleaned easily, so hassle-free maintenance is guaranteed. 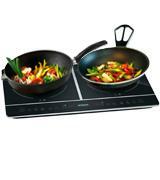 Finally, ceramics used in cooktop production is reinforced and is usually scratch- and shock-resistant. However, regardless high quality of this material, it’s better to treat it carefully if you want your induction cooktop to serve you a lifetime. 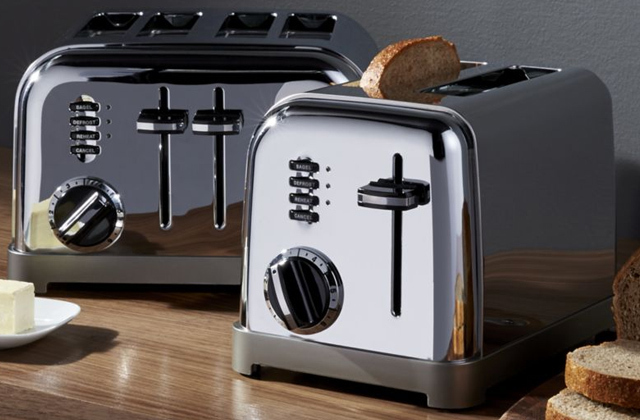 One of the main criteria people consider before buying any kitchen appliance is definitely its dimensions, especially, if their kitchen isn’t spacious enough for full-sized devices. 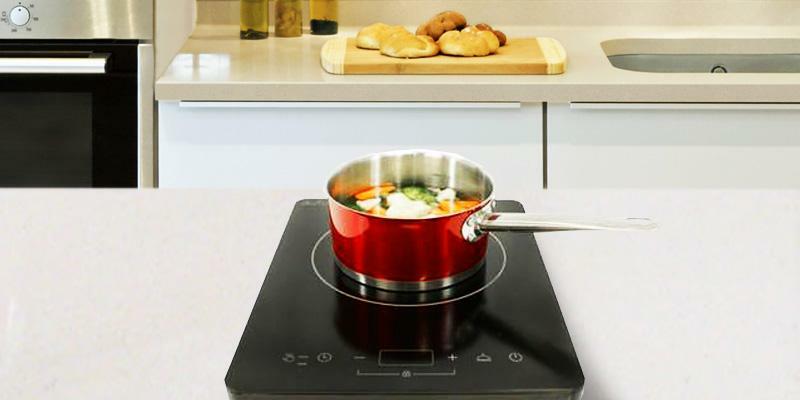 If you’re one of those who need a small yet effective induction cooktop, it’s time to have a look at ElectrIQ EIQICBTW Single Portable Induction Hob. Despite its compact size, the hob boasts the maximum power of 2000 Watts that suffices to handle cooking even the most complicated dishes. It also becomes possible thanks to 10 preset temperature and power level settings. 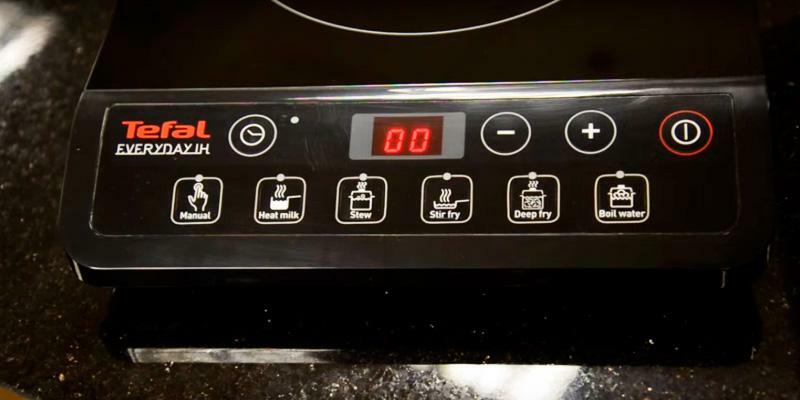 And a 180-minute timer is what rids you of the necessity to spend hours constantly checking whether the dish is ready. 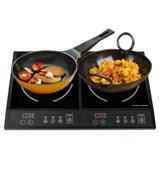 ElectrIQ induction hob is a nice choice that will definitely meet your expectations. The only thing to keep in mind is that the maximum diameter of the cookware suitable for this hob is 20cm. Note that not every pan can be used for cooking with an induction cooktop. 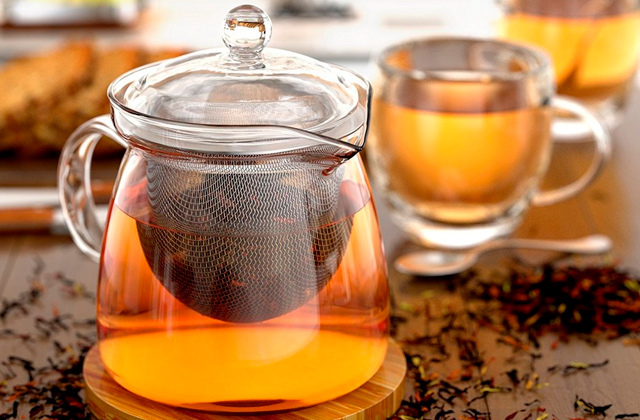 Check out our cookware sets review to pick the one to meet your needs. As it was mentioned above, not all cookware is suitable to use it with induction cooktops. Here are some advice on how to choose the right cookware. 1. Cookware should possess ferromagnetic properties. It’s not necessary that the whole pan is made of such material; a ferromagnetic base is enough to use cookware with an induction hob. To check whether a pan is ferromagnetic, try a magnet, if it sticks to the pan’s base firmly, the cookware is suitable. 2. Pay attention to the pan’s base, it should be thick enough (no less than 5 mm) to withstand high temperatures. A thin base can get damaged causing uneven heat up. 3. Take notice of the stickers you find on pans’ surface. In general, manufacturers mark the cookware suitable for induction cooking. A display is a must-have part of any induction cooktop since it shows you all necessary information about the cooking process. As for ElectrIQ EIQICBTW Single Portable Induction Hob, its large and bright display is situated in the centre of the control panel, so it’s easy for you to monitor time, power or temperature while cooking. Looking for a new cooker for your kitchen? 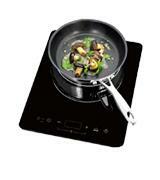 Consider choosing an innovative energy-efficient induction cooktop! Conventional electric stoves have heating elements, induction cooktops work in a different way.They use magnetic induction to heat the cookware while the hob is heated only by the cookware on it. 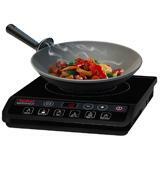 The main advantage of an induction cooktop is efficiency. Your pots and pans are heated immediately and your meals are ready in no time, whereas common electrical and gas cookers emit a lot of heat. At the same time, induction cooktops are safe. The device turns on only when you place some cookware on it. 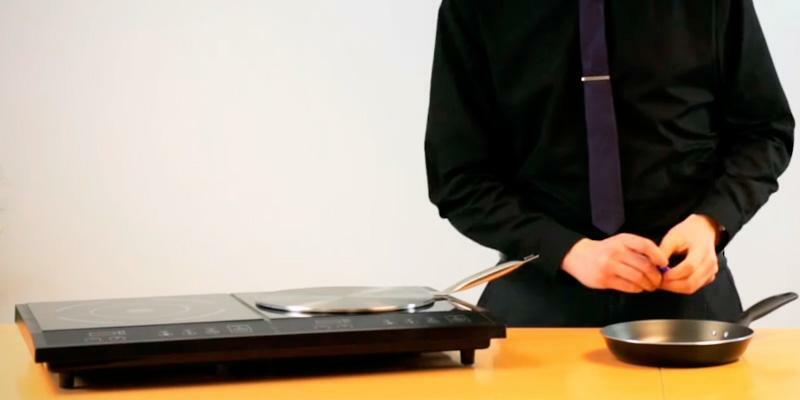 As soon as you remove it, an induction cooktop turns off automatically. 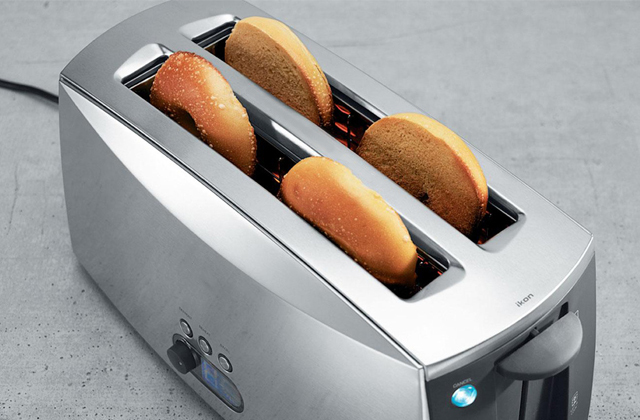 However, this appliance has a peculiar feature. It will heat only those pans and pots that are made of ferromagnetic(e. g. stainless steel or cast iron). We have reviewed five best induction cooktops, please, compare them and choose the one you like the most! If you enjoy cooking sophisticated dishes that require precise following of the recipe, it is worth getting one of the appliances from our kitchen and food scale review. The first issue you should keep in mind while choosing the cooker is its type.Countertop induction cooktops are portable so they are perfect for any small kitchen. You can place the appliance on your kitchen table/countertop for the utmost convenience. They are usually equipped with one or two burners.The second type, built-in induction cooktops, have higher power compared to countertop models; they usually have 3-6 burners of various sizes and shapes. However, built-in cooktops have larger dimensions, while a small kitchen requires a portable device. 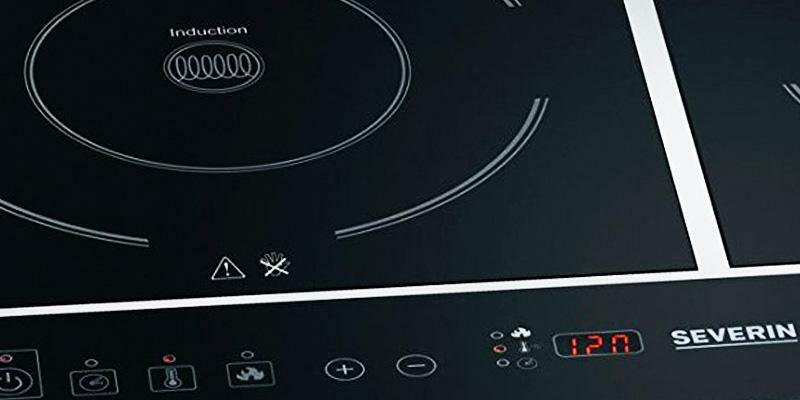 The main feature that determines the performance of any induction cooktop is a temperature range the unit provides. Multiple temperature modes will help you select the right one for preparing your favourite dishes. 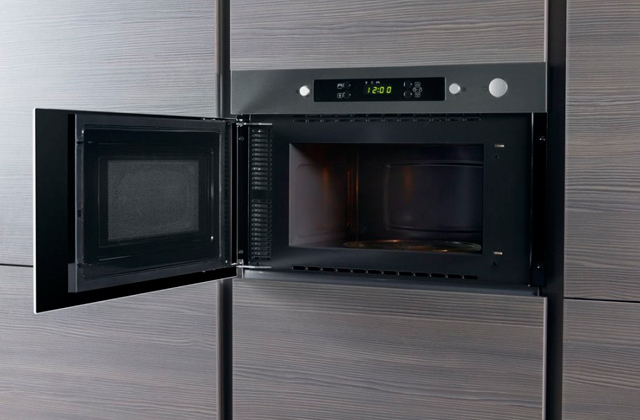 Some recipes require a low-temperature cooking, others need a higher temperature; now you can choose the optimal device to meet your daily needs! 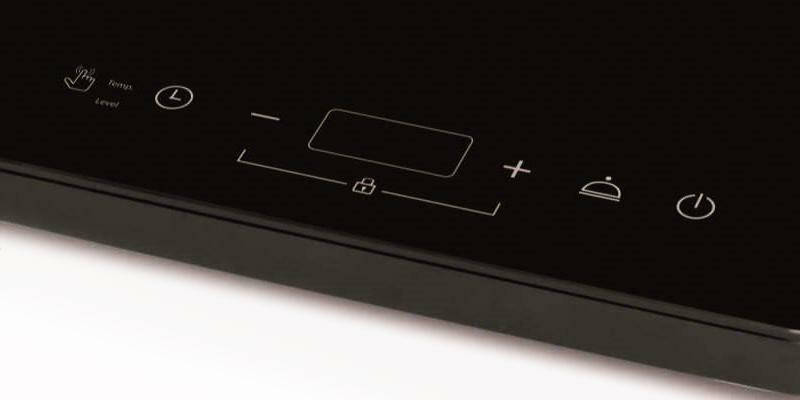 The induction cooktop usually has 10-15 power levels so you can easily adjust the power level. Owing to an up-to-date digital control panel with an easy-to-read display, using such appliance is literally a piece of cake. 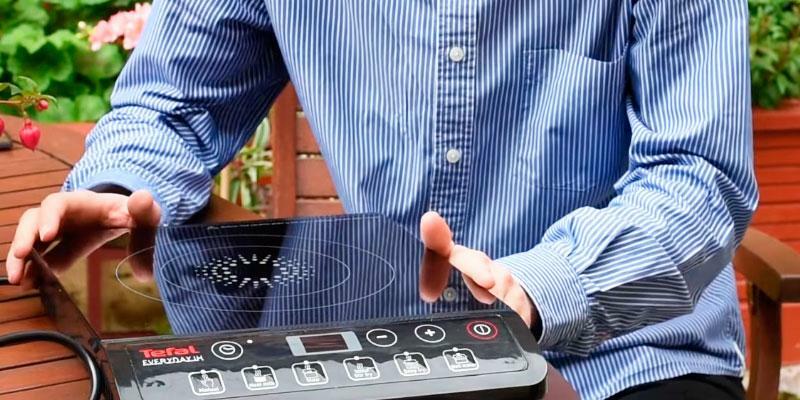 In addition, some manufacturers provide their induction cooktops with ergonomic touch control panels.Choose the appliance that suits you best! Owing to multiple options, cooking is as easy as it has never been before! To control the process of preparing meals, an induction cooktop can be equipped with a timer that makes an audible beeping signal when your dish is ready. 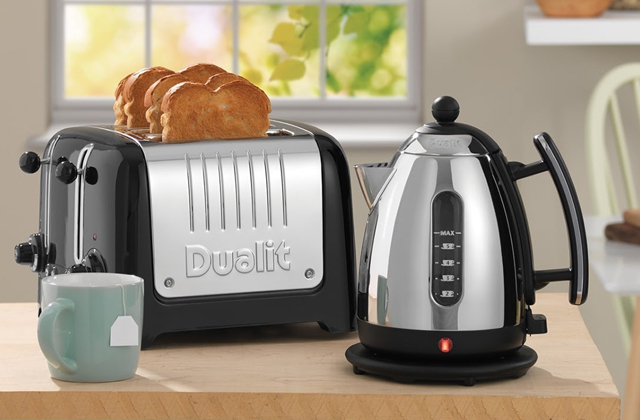 Thanks to Auto Pan Detection with an auto-off feature, the appliance shuts off if there is no cookware on it. Parents will appreciate a Child LockSystem that won't let their kids use the device without adults'supervision. 1. 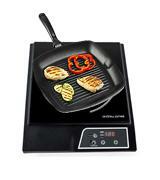 Matthew Steen Induction Cooktop Buying Guide, choice. July 14, 2016. 2. 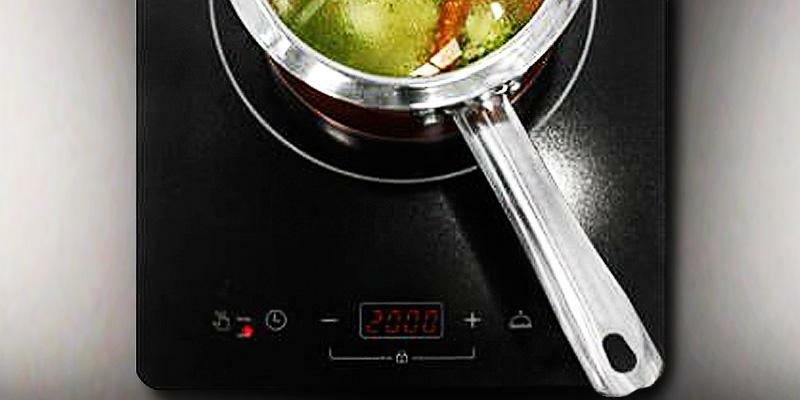 Induction Cooktop Guide, eBay. April 24, 2014. 3. Induction Cookers–Everything You Need to Know About, TechLineInfo. July 4, 2012. 4. Ceramic vs Induction Cooktops Buying Guide, Harvey Norman. 5. Nicholas Gerbis Buying an Induction Cooktop, HowStuffWorks. 6. Induction Cooking, Wikipedia. July 17, 2016. 7. Janice Lawandi How an Induction Stove Works, and the Right Pans to Use, Kitchn. April 16, 2015. 8. Alexandra Foley A Recipe for Induction Stove Design Using Multiphysics Simulation, COMSOL. June 10, 2013. 9. Electromagnetic Induction, Wikipedia. August 4, 2016. 10. Chris Woodford Induction Cooktops, ExplainThatStuff. February 12, 2016.